Dwarven Oil is dropped by Dwarven automatons. Dwarven oil has all the same effects as taproot, allowing you to make a potion with all four effects. Dwarven centurions (including Dwarven centurion guardians and Dwarven centurion masters) are guaranteed to drop at least one sample of Dwarven oil. 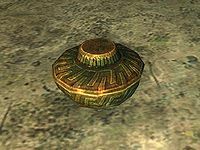 All other automatons, in particular all varieties of Dwarven spheres, Dwarven spiders, and Dwarven ballistaeDB, have a 50% chance of dropping one sample. This page was last modified on 9 April 2018, at 04:02.